President Uhuru Kenyatta with Interior Secretary Fred Matiang'i. 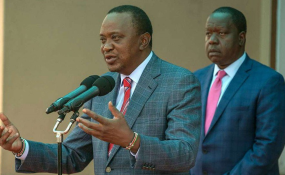 President Uhuru Kenyatta Tuesday appointed Interior Cabinet Secretary Fred Matiang'i to chair a committee mandated to supervise all government projects, including the Jubilee government's legacy-driven 'Big Four' agenda. Dr Matiang'i will chair the newly constituted National Development Implementation and Communication Committee, and will be deputised by his Treasury counterpart Henry Rotich. The team will comprise of all the Cabinet Secretaries, Attorney-General Paul Kihara, and Head of Public Service Joseph Kinyua. Dr Matiang'i, long-seen by analysts as President Kenyatta's Mr-Fix-It, will in the new position effectively be the prefect of his colleagues, and will report directly to the President. "The committee will provide supervisory leadership throughout the delivery cycle of all national government programmes and projects. . .They will monitor and evaluate the follow-up mechanisms for resources allocated for national government priority programmes and projects, to ensure proper utilisation and realisation of the targeted outcomes," the President said in his Executive Order January 21, 2019. The committee will also provide "coordinated and strategic communication" to the public and other stakeholders on the progress of national government projects and programmes. It will also "prepare accurate and timely progress reports for presentation to the president." In his speech in Mombasa before the Executive Order was made public, President Kenyatta said the changes were being made to align all ministries to adopt a 'One-Government Approach Policy." Besides the sweeping powers he will have as the chairman of the committee, Dr Matiang'i was also given a huge chunk of James Macharia's Transport ministry. The Interior CS, in President Kenyatta's Executive Order No. 2 dated the same day as the first, will be in charge of the National Transport and Safety Authority. This is seen as an attempt to align the President's transport sector vision with what Dr Matiang'i had been doing with the implementation of the Transport Act, famously known as the "Michuki Rules". The rules came about during John Michuki's tenure as Transport minister. The interior ministry, in the changes, will also be in charge of motor vehicles inspection and certification, regulation of public service vehicles, development and implementation of road safety strategies, enforcement of the axle road control through weighbridges, as well as regulation and licensing of motor vehicles.